Initially, I’d like to thank you very much for this interview. I have been supporting the band for a very long time and I’m pleased to get to know that you have released a new album. Please, I ask you to introduce yourself to your readers. Hécate – Miasthenia was founded in 1994 and we complete our twenty years anniversary as a band. We have just released our fourth full-length album; the lyrics are in Portuguese and have a pre-Colombian pagan thematic. The band is composed of myself (vocals and keyboards), Thormianak (guitars) e V. Digger (drums). As I’ve mentioned before, I’m very happy to know that you have released a new album “Legados do Inframundo”. Could you talk about when it comes to the music featured on it? Have you noticed any difference in reation to your previous album, “Supremacia Ancestral”? Hécate – Yes, we try to improve ouserlves in every new album, improve the compositions as well as the recording quality. Both albums were produced by Caio Duarte, whose each year has been perfecting his recording techniques as well. 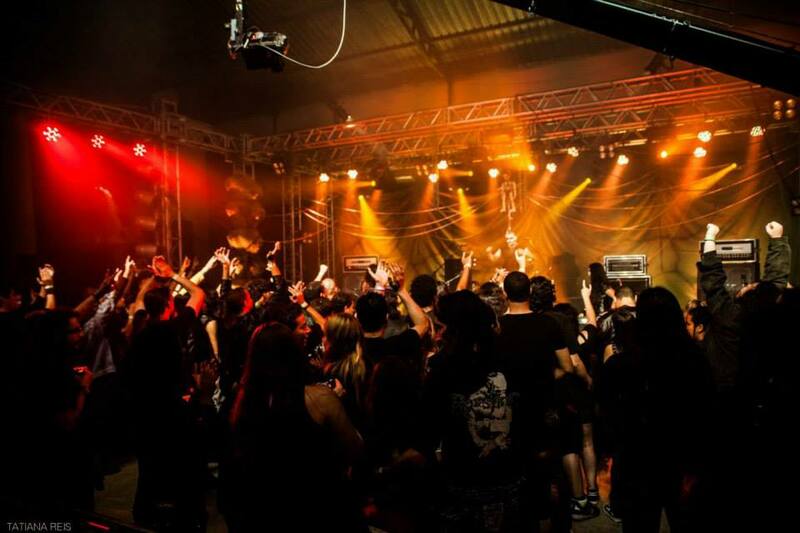 Musically, “Legados do Inframundo” has a stronger metal grip, with passages that goes from epic heavy metal to extreme metal, being more aggressive and obscure. Still on the new album, I’d like to know about the lyrics and it it’s a conceptual album. What would be the “Legados do Inframundo” thematic? Hécate – it is a conceptual album, about our passage throughout a non Christian, the underworld or, for the ancient Mayas, the Xibalba, where everything is possible, the place of the beginning and ending of life. Our journey to Xibalva is a poetic metaphor to our chaotic views of existence, to live is like riding to this hell, in which people decay with no reaction while others are able to fight and to survive with abundance in comply with chaos. In some moments of our lives we reach the “rock bottom”, in the underworld of the soul, but you have to overcome all the challenges and reborn with wisdom even though there’s chaos, as there is no perfect paradise, so don’t fool yourselves with dogmas and fundamentalist religions that promise salvation. You have to go to war in this reign of death, you must have courage and strength to go through it, because there’s no ending, there is no god, you have to live with wisdom facing death, destruction, darkness and human ignorance, and to learn with it all, you can not deny this legacy that honors your existence. We will not abandon this journey! In order to be able to talk about this, we are also inspired by the stories and prophecies of death and destruction that were part of the Mayan society. After all, as an old Mayan priest stated “everything walks, everything ends, all blood reaches its place of rest, as all power reaches its throne”. In addition to the previous question, the band’s thematic is indeed very interesting. For the ones that didn’t know (but are already becoming familiar due to Hécates’ answers), it’s about Latin America’s history and mythology. I am aware that Hécate has a doctor degree in History, but, initially, as a human being and as a band, what drew you to this subject? Hécate – the interest is due to my pagan conceptions concerning reality, the wish to learn about other philosophies, beliefs, visions about the world and stories that break away from the dogmatic and petty Christian views. My interests for these themes are also connected to my engagement with Black Metal music. The band as released a DVD, which I have the pleasure to own a copy, named “O Ritual da Rebelião”. Could you tell us a bit about this release? Hécate – This DVD (Bootleg) was released by Mutilation Records and contains non Professional recordings of shows that took place in various cities in Brazil (Campo Gramde, Cuiabá, São Paulo, Rio de Janeiro, Porto Alegre, Jundiaí, Belo Horizonte, among others, during 2000 up to 2010. it is a very important record of the band’s concerts, which shows very well the underground spirit as well as the reality of concerts in Brazil. Not only about the DVD, but concerning Miasthenias albums, especially the new one, “Legados do Inframundo”, can you tell us if there’s an alternative for non South Americans to buy your releases? Is there any official distributor in Europe? Hécate – our albums have always been sound in foreign lands by underground stores and distros, but we never had the support from a foreign label to release any material. There was a purpose to release “Legados do Inframundo” from the Ukraine, but nothing has come to reality so far due to the hardships taking place there. 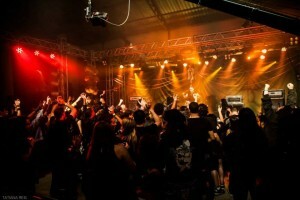 Miasthenia has played very often in Brazil. In my personal opinion, I believe that the band deserves more attention and recognition, not only when it comes to the Braziliam scene, but also outside Brazil. I also know that the band will not play at any rat holes simply to say that have played in different countries. But, in any way, is there any chance of an international Miasthenia tour? Hécate –Yes, there is, we are planning that. The lack of time to play a longer tour is the biggest difficulty that we face, as we have our regular jobs and we can’t simply abandon them to play for a month or more, but we are trying to find a way to play outside Brazil and, especially, to have a larger tour in Brazil. Connected to the previous question, you have been working for some time with Misanthropic and Mutilation Records. Are you satisfied with the work from the label in regard to the new album “Legados do Inframundo”? Isn’t there any sort of pressure for Miasthenia to release more albums with a bigger frequency? Concerning Misanthropic, this was our first release. We know Canis Lupus for many years, but only now there was a mutual interest and, concerning Mutilation, this was our second release in four years. We still can’t measure the releasing work, as the album was released on March, 18th, about three months, we’ll have to wait and see what was promised by the labels when it comes to promoting the album, among other things, such as the vinyl release on the second semester. In Brazil, labels are only partners, as the bands do everything and then give all the work to them to sell the band’s material. We don’t earn any money with this, so there’s no pressure to release anything. We only do what’s in our reach. While our music is relevant for us, there will be Miasthenia releases, there’s no meaning if it’s not that way. Brazil is a huge country, very diversified, be it about the population, the way of life, nature, there are many differences. How do you feel about the Brazilian underground? Are there any differences from region to region? Is there any rivalry or the union/ alliance is stronger? This was a mine field, if you understand me, the metallic underground has faced terrible things, many fights, jealousy, lack of character, from north to south. Those who are familiar with us are aware, not only about the extreme music, that we had to physically fight not to succumb. Today we are practically survivors, many have become evangelical Christians or simply vanished from the map not to become easy targets. Pseudo Nazis, stupid Radicals, alcoholic and addicted metal heads stood in our way, but, due to our strength, our path has been cleared. Nowadays there are few people that remember those days and that, also luckily, have matured enough to walk their own path and not to get in the way of others. This is a question that might be connected to the previous one. In my humble opinion, Hécate has exceptional vocals. I’d like to know about the female “issue” inside metal, and, if in your opinion there’s still prejudice because of this, not only in Brazil, but worldwide. Just another day I interviewed a Swiss band which mentioned that there’s still this sort of prejudice there. Yes, there is, veiled, but the Black Metal male chauvinists don’t stand that a woman does something that it’s supposedly for men, but, as I’ve told you before, we overcome this with the motivation on making relevant music, be it about the sound as well as the ideology and if we need to fight for this, we will, like we did in the past. The band has been active for twenty years. Twenty years of underground and fights. What are the main differences that are noticed by the band comparing two decades ago to now, in the underground as well as about the fans? What motivates you to keep on battling? We are more mature, as human beings, we now know things that before we just guessed about. Nowadays what we do, we do for the devotion of our legacy and I repeat, the relevance for us is very important. A band that exists on the underground for twenty years, releasing material every four or five years means that we do this because we like, not for vanity, but to keep the flame alive, especially in our hearts. The fans have become more friendly and know that we have honesty and they like what we release. And we reach the end of this interview. I thank you very much once again for this opportunity. It is indeed an honor for me! Any last words for our readers?